One of the techniques you can apply to take your baking to the next level is cake airbrushing. You can use cake airbrushes to add designs, special effects, and patterns to isomalt, icing, piping, fondant, sugar paste, gum paste, and cakes. Airbrushing makes your baking imagination come alive. To decorate, you need to apply the airbrushed color to the icing already on the baked cakes or cookies. You do not mix the color to the icing and then apply it on your cakes or cookies. Airbrushing allows you to make precise decorations. The technique is quite neat compared to the traditional decoration method of filling and using icing tubes. There are dozens of edible airbrush paints on the market. The paints come in different brands and colors, which make your work of mixing food color easier. To decorate cakes, simply fill the airbrush with the edible paint color you prefer and start creating! Airbrush kits, edible paints, and airbrushes are easy to use for both beginner and experienced bakers. The kits make it easy to color, shade or blend different areas of fondant and icing. You can also use edible paints with stencils to write a script or add accents and detailed designs and patterns. When you have a cake airbrush kit, you only need a little imagination and practice to create amazing baked goods in no time! Whether you are a professional or home baker, you will love the Master Airbrush G23-22 Cake Decorating System. This is a standard 4-color cake decorating airbrush kit that comprises of four bottles of Chefmaster airbrush food colors, a portable mini 110v AC airbrush compressor, and a high-performance, dual-action Master airbrush with one-third ounce gravity-fluid cup. The Master airbrush cake decorating system comes with a high-quality airbrush that has a 0.3mm needle. The fine airbrush nozzle can spray thin lines up to 1 ½ inches wide to create intricate patterns. The mini 110V AC airbrush compressor has a plug-in adapter, air flow adjustment valve, and a 6-inches braided air hose. The 12V DC air compressor is light, works quietly, and can deliver 10 liters/per min at 18 PSI. Master bakers have trusted Chefmaster food colors for more than 50 years. The edible food colors are also favorites of both master and beginner cake decorators. The cake airbrush kit also comes with a How-To Airbrush Book to help you get started easily with cake decorating. You will find everything you need to come up with creative cake decorations in the Master Airbrush G23-22 kit. The included airbrush has a one-third ounce gravity-fluid cup where you will put the food colors. The available Chefmaster airbrush food colors (Midnight Black, Canary Yellow, Super Red, and Hawaiian Blue) are certified Kosher and are made with ingredients approved by the FDA. The Master Airbrush Kit is affordable, has a quiet air compressor and comes with FDA-approved food colors. The cake decoration kit also includes a ‘How-to” guide that will help you get started with it easily. However, the kit’s assembly instructions are not very clear. The US Cake Supply Decorating Kit is also suitable for both beginner and expert bakers. The cake decoration kit comprises of 12 bottles of US Cake Supply airbrush food colors, a mini 110V AC airbrush compressor, and a professional, single-action airbrush. Inside the US Cake Supply Kit, you will find 12 edible, spray-on airbrush food colors and a coloring chart to guide you on mixing them. There is also a detailed User Guide with information on airbrush tips, designs, and techniques. Going through the guide will help you to understand how to use the airbrush properly. You can make awesome cake decorations with the US Cake Supply kit. This kit has a single-action, gravity-fed airbrush with a 1/16 ounce gravity-fluid cup that holds the food colors. The food colors available are Metallic Silver, Metallic Gold, Midnight Black, Harvest Brown, Deep Pink, Violet, Royal Blue, Spring Green, Canary Yellow, Super Red, Sunset Orange, and Hawaiian Blue. All the food colors are Kosher-certified and are made from ingredients approved by the FDA. The US Cake Supply’s airbrush has a 0.4mm needle. Its mini 110V airbrush compressor has a plug-in adapter, three airflow control settings (low, medium and high) adjustment valve, and a 6-inch rubberized air hose. The 12V DC air compressor is light, operates quietly and can deliver a maximum of 13 liters/per min of air at 15 PSI. The US Cake airbrush kit is easy to assemble and clean. The airbrush has three airflow settings and comes with a detailed User Guide. The kit also includes FDA-approved food decoration colors and is sold with a lifetime guarantee. However, the compressor is not powerful enough for intense decorations. The Cake Boss Airbrushing Kit comprises of an air hose, a compact 110V AC airbrush compressor, and a chrome-plated airbrush. 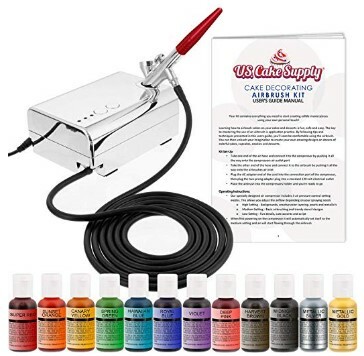 Other items included in the kit are a Cake Boss instruction book, special nozzle wrench and cleaning tool, plastic dropper for transferring colors from mixing containers or bottles into the airbrush cup, and a rubber hose. All these items are stored inside a plastic storage case. The cake airbrush kit is suitable for both beginners and experienced bakers. 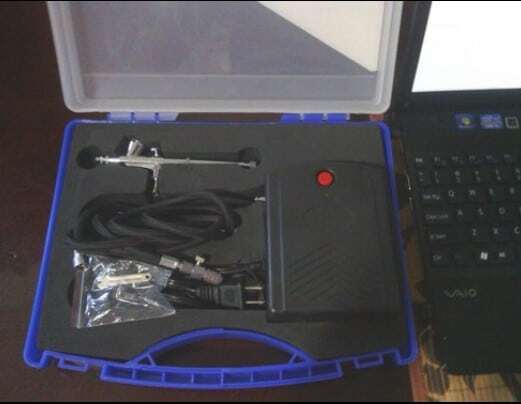 The 100V AC power airbrush compressor is sturdy and compact. The 12V DC compressor is also lightweight, operates quietly and delivers a maximum 18 PSI of air. 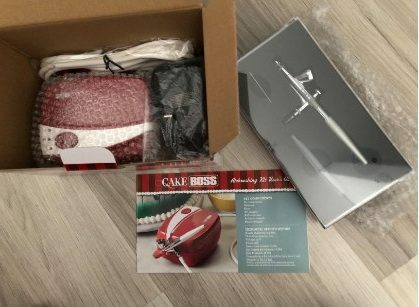 The Cake Boss decorating kit comes with a 1-year limited manufacturer’s warranty. The tool is also designed to be compatible with other Cake Boss Bakeware and decorating supplies such as impression mats, fondant rollers, and so on. The Cake Boss is an affordable cake decorating kit that is easy to use and clean. The kit comes with an airbrush with three flow settings and has a 1-year limited manufacturer guarantee. However, unlike other cake decorating kits in this review, the Cake Boss does not come with edible food colors. Moreover, you will have to refill the small cup regularly when doing intricate decorations on large projects. The Kopykake Airmaster cake decoration kit comprises of a precision chrome-plated airbrush and a compact 110V AC airbrush compressor. The crown cap of the 1/16 oz. gravity-fed airbrush has been designed to reduce clogging and uncontrollable overspray. The compressor has a bleed control valve for adjusting the airflow. The valve comes handy when you are undertaking different projects. For example, you can set the airflow to light when doing delicate work that requires fine lines or to heavy for broader overall coverage. Both experienced and beginner bakers will find this cake decoration tool an excellent accessory for their baking projects. The cake decorator’s compressor is sturdy, fully-enclosed and operates quietly. The compressor comes with a nozzle wrench and a 6-inch rubberized air hose. Its adjustable air pressure valve can deliver maximum air at 30 PSI. There is also an inbuilt accumulator tank that eliminates pulsation. The Kopykake is a high-volume decorating set that is easy to use. The tool has a quiet air compressor and comes with an instruction manual. However, the Kopykake cake decorating machine tends to become unstable at high pressure. Moreover, the kit does not include edible food colors. There are different types of cake decorating airbrushes on the market. Before choosing a cake airbrush kit, it is important to do your research well. In particular, you should check the kit’s compressor power. Ideally, you want a single- or dual-action airbrush gun with a sufficiently-powered air compressor. Some kits also come with FDA-approved food colors. If you are a beginner, you should get a simple cake airbrush kit. This is because you will need to learn how to control the tool and be consistent when using it. Finally, you should know how to clean the airbrush to prevent clogging. If you are just starting and are only looking for a simple cake decorating tool, go for a single action, gravity-fed airbrush. With this brush, you can work slowly as you learn its capabilities. As you get more comfortable with the tool, you can switch to a gravity-fed, dual-action airbrush. As you improve your cake decoration skills and expertise, you can choose to use one airbrush per color or one bottle for each color. To speed up your production, consider using a siphon-fed airbrush. Edible food color can be mixed either inside or outside the airbrush. The way the paint mixes with the airflow will determine how the spray will appear when it touches the surface of your cake, cookie, or other baked good. With an internal mix airbrush, the air and paint are blended inside the airbrush tip before being discharged. This type of airbrush produces a more consistent spray. With an external mix airbrush, you can control the amount of paint to be mixed using a small knob on the airbrush gun. With this tool, the food paint and air blend after exiting the tip of the airbrush. External cake airbrush guns are suitable for decorating small areas that do not require details. Airbrushes have a trigger that is used to control how the food color functions. The triggers of a single-action and a dual-action airbrush work differently. A single-action airbrush works like a can of spray paint. However, with this airbrush, you can adjust the air pressure as well as the amount of paint that is applied. When you push down the trigger, the paint and air will be released simultaneously. To stop the paint flow, release the trigger. There is a separate volume control knob that regulates that amount of paint that comes out when the trigger is pressed. You can thin (decrease) or thicken (increase) the paint flow by turning the knob either clockwise or anticlockwise. The spray pattern made by a single action airbrush will depend on how far away from the cake the tool is when spraying. If you want a small spray pattern, spray closer to the cake. On the other hand, spraying far away from the cake will result in a larger spray pattern. With dual-action airbrushes, you can paint non-stop since you don’t have to stop to adjust the flow of paint. The airbrush compressor has a setting for controlling the amount of air released. Pushing down the trigger releases air while pulling it back releases paint. The thickness of your paint spray will depend on how far back you pull the trigger. Generally, dual-action airbrushes give you more control over the painting process. If you have a cake decoration project that involves varying color layers or spray widths, you will get the best results using dual-action airbrushes. The spray pattern will depend on how far away from the cake or baked good you are spraying from. If you are close to the cake, the spray pattern will be smaller. On the other hand, the pattern will be larger if you are further away from the cake. There are three main types of cake airbrushes. All airbrushes, whether they are single-action or dual-action, fall under these three categories. These tools require the least amount of air pressure to operate. The airbrushes operate more slowly and, hence, are perfect when you need to make detailed cake patterns. To get started, you need to fill the small bowl on top of the airbrush gun with edible paint. From there, you need to pull the trigger to get air flowing into the air gun due to gravity pull. As a result, the gravity will force the paint into the nozzle and out of the tip. The nozzle tips of gravity-fed airbrushes range from 0.10 mm to 0.35 mm. These airbrushes are efficient and require less air than gravity-fed airbrushes. The cake spray airguns spray more paint at a time, allowing you to work faster. Siphon-fed airbrushes can use different size color bottle and cups. Moreover, you can change the colors quickly. The nozzle sizes of the tools range from 0.1 mm to 0.5 mm. These cake spray air machines have a color cup attached to the side. The tools can either work like siphon-fed or gravity-fed airbrushes, depending on whether the color is above or below the nozzle. The color cup on the side can rotate 360 degrees. Therefore, you can work with the tool at any angle, including upside down. The nozzle sizes of these airbrushes range from 0.10 mm to 0.35 mm. The best edible airbrush paints are those that can easily pass through the spray gun without getting clogged inside. Moreover, the paint should retain their body when sprayed on the cake surface. Edible or food paints come in different colors. Depending on the type of cake decoration you are doing, you can get pearl, metallic, rainbow, seasonal, or vivid primary colors. If you would like your cake to have an iridescence property, use metallic or pearl food colors. To create pastel shades or hide script, decorating, or spraying errors, use opaque white food colors. The best food colors are Kosher-certified and FDA-approved. Majority of the best airbrush for cake decorating kits include bottles of food color that you can use to spray on isomalt, fondant, icing, sugarpaste, gum paste, pastries, and cakes. Cake spraying machines allow you to easily paint and decorate fondant and cakes. You can use these tools to come up with beautiful accents, pastels, and shades on your baked goods. The detailing requires long, narrow-pointed nozzles that the spray guns have. You can also use cake spray guns for coverage. Generally, it is easier to blend and cover large areas of a cake. However, to achieve the perfect spray, you will need to practice and patience. You do not want to overspray your fondant or cake. The goal should be to cover the cake in as few passes as possible. With the right airbrush, you can create a wide variety of decorations. You can get beautiful creations fast using an airbrush on motifs, stencils, and silhouettes. For example, you can create detailed features such as scripts, curls, dew drops, and stems using an airbrush and a stencil. You have to put the stencil close to the cake to ensure the resulting pattern is not blurred on the edges. Cover the surface of the cake to protect it from mixing spills, oversprays, etc. Hold the airbrush nozzle about 6 to 8 inches from the surface of the cake. 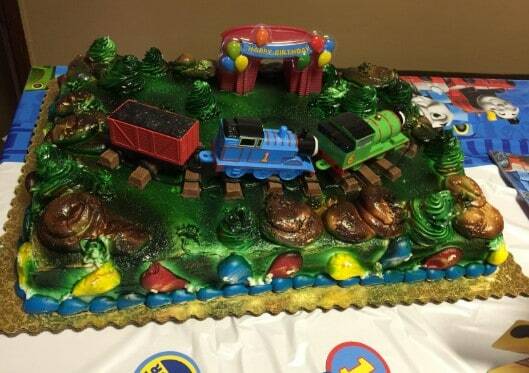 If you hold the nozzle too close, the pressurized air can pock-mark the cake. On the other hand, if you hold it too far away, the airbrush color will spray where it should not. To get soft, wide lines and passes, hold the airbrush nozzle at a 45° angle. For sharper and defined lines, hold the nozzle at a 90° angle. Spray the edible color on your cake. If you want the color to darken, spray it again. 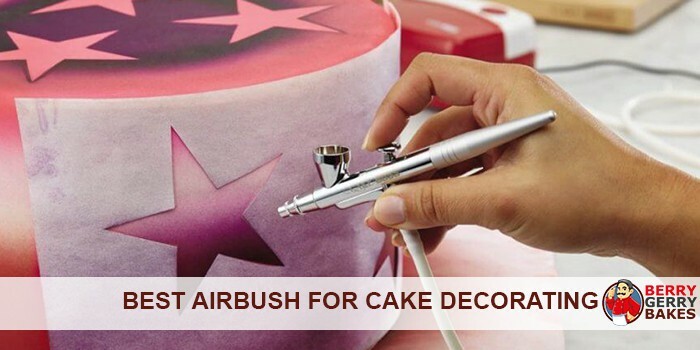 You can use airbrushes to decorate fondant cakes, icing, and cookies. You can use a stencil or motif to imprint a pattern directly onto fondant and then use an airbrush to add depth, detail, and texture. If you want to create edible artistic works, get isomalt. This is a sugar substitute that can be heated and molded into different shapes, including ribbons, flowers, and geometrical shapes. After creating with isomalt, you can use an airbrush for highlights, to add dimension, or accentuate the shape’s features. You can enhance airbrush decorations with various elements such as inscriptions, buttercream accents, and borders. With edible markers, you can draw or write directly on fondant cakes. You can make edible images using an edible printer. You will need edible printer icing sheets and ink for this exercise. For flowers, ribbons, or features, you can use rice paper. You can then airbrush your creations to add depth, shadows, or realism to them. There are three main things to keep in mind when looking for an airbrush cake decorating kit. These are the airbrush, compressor, and edible food colors. You should know about single-action and dual-action airbrushes, how they work, and their differences. The best cake airbrush for beginners is a single-action one. For intricate designs, you will want a double-action airbrush. Generally, a cake airbrush kit includes a compatible single- or dual-action airbrush and a mini air compressor. Some of the best cake airbrush kits also come with edible food colors that are Kosher-certified and approved by the FDA. 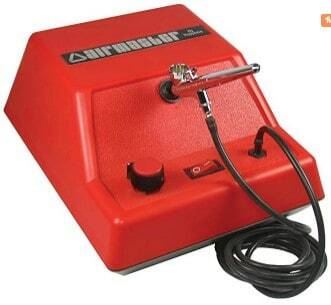 Advanced cake airbrush systems may come with a single- or dual-action airbrush but with a more complex air compressor. You can adjust the compressor to control how strong the spray is and the color that will be applied to your cake. Which is the Best Cake Decorating Airbrush? There are many types of airbrushes for cake decorating on the market. 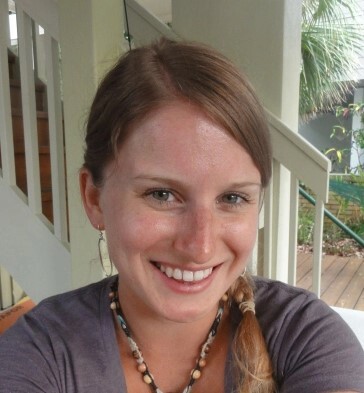 You should research well to determine the right kit to choose. We recommend the Master Cake Decorating kit as it is not only affordable but also comes with FDA-approved food colors. The tool is easy to use and clean, and comes with a lifetime warranty. If you are a beginner and would like a cheap airbrush, we have a couple on our store that would be perfect for you.